Remember when Planned Parenthood tweeted on Halloween that it’s safer for black women (and abortion providers’ bank accounts) if they have abortions rather than give birth to their children? Well apparently, that’s because we're all racists. 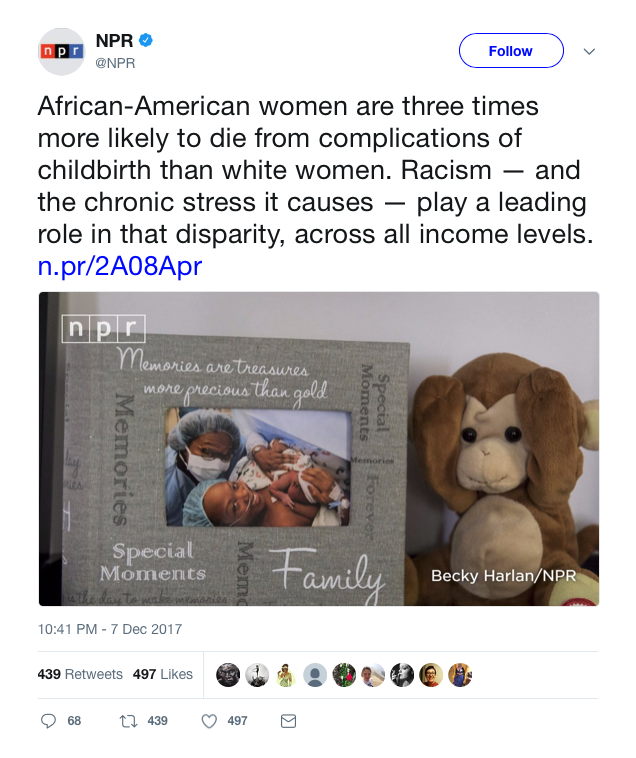 The taxpayer-funded National Public Radio purported in a tweet Thursday that black women are suffering from higher childbirth-related death rates because of "racism." The story chronicles the untimely death of Shalon Irving, who “collapsed and died from complications of high blood pressure” three weeks after giving birth to her first child, NPR tells us. "Even Shalon's many advantages — her B.A. in sociology, her two master's degrees and dual-subject Ph.D., her gold-plated insurance and rock-solid support system — had not been enough to ensure her survival. If a village this powerful hadn't been able to protect her, was any black woman safe?" NPR asks. Answer: well, not if said accomplished black woman has fatally high blood pressure, which frankly has nothing to do with her skin color. But alright. On top of blaming everything from poor quality food to the lack of reliable transportation for health problems in black women that could lead to childbirth issues, NPR also points to “the feeling of being devalued and disrespected by medical providers” that many black women say they feel. It’s not measureable by any proven standard, of course, but it’s apparently a thing we should assume is true. Oh – and the stress of being a black woman is also a factor. NPR doesn’t exactly explain why, exactly, other than the apparently incontrovertible reality of black women “having to work harder than anybody else” which “puts the body into overdrive.” Again, not sure why. NPR conveniently leaves out one possible risk factor in black women having complications from childbirth: abortion. In New York City, for example, a stunning one out of every three children are aborted. Despite making up a significantly smaller percentage of the overall population, roughly 40 percent of all abortion victims are black children. Nearly 80 percent of Planned Parenthood’s abortion clinics are located in urban communities populated mostly by minorities. In fact, abortion is the leading cause of death among black Americans. Additionally, having an abortion – particularly more than one, and/or a late-term procedure – has been proven to increase a woman’s risk of breast cancer, premature birth of subsequent children, infertility, and future conception and childbirth complications. All of this on top of the fact that a successful abortion always results in the death of at least one human being. But of course, black women’s disproportionately higher abortion rate couldn’t possibly have anything to do with their increased risk for childbirth complications. Such preposterousness is certainly not worth investigating, and how dare you ask? Because clearly, the culprit is straight-up racism. “There's something inherently wrong with the system that's not valuing the lives of black women equally to white women," NPR purports. Yes, that must be it. It’s “the system” perpetuated by the rest of us that’s racist – not the genocidal maniacs who value a black woman only to the extent of killing her child, selling its organs and making a buck, regardless of whether it ups her chances of complications down the line. We can't ask that question.